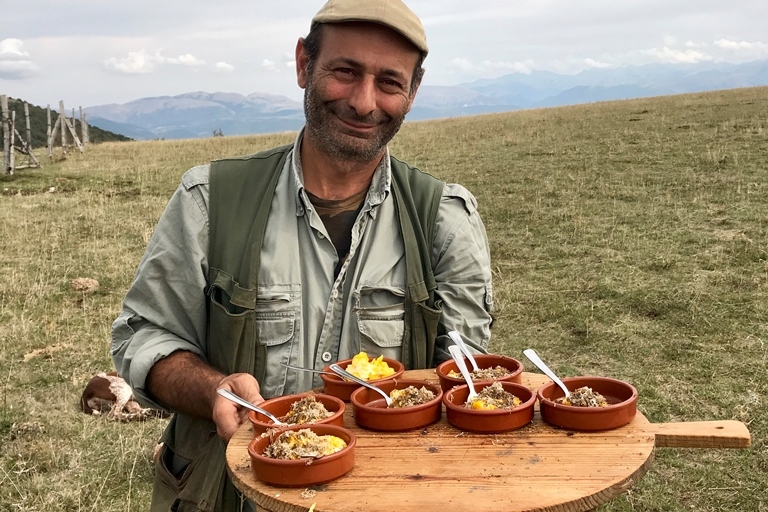 Treat yourself to an unforgettable day of truffle hunting in Umbria, and so much more, with Wild Foods Italy. 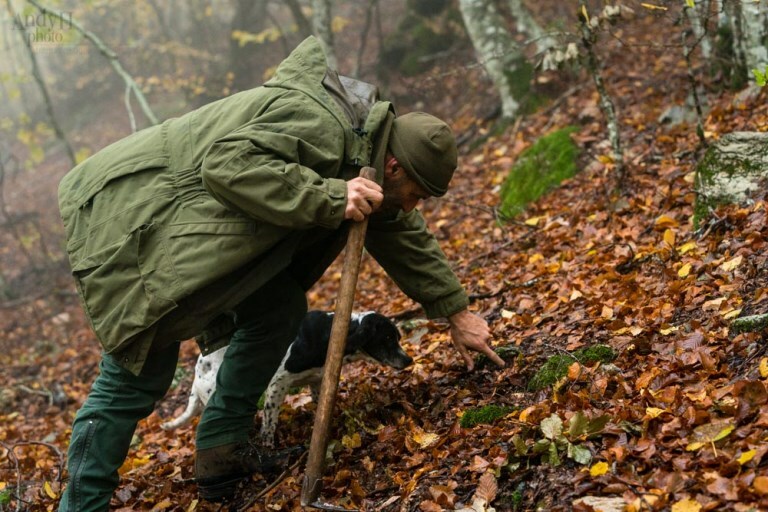 More than just truffle hunting – spend a day immersed in the culture and cuisine of our ancestral village of Pettino and the traditions of our family who have been custodians of this land for many centuries. 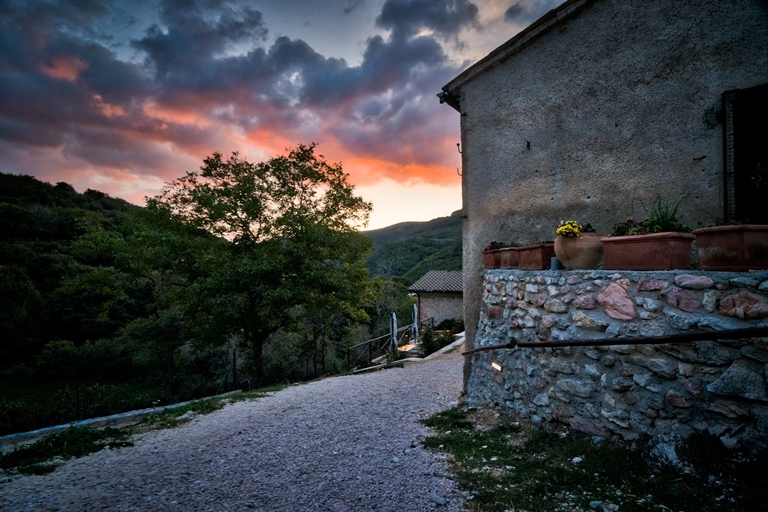 Before your arrival, enjoy the breathtaking drive up to our picturesque mountain village of Pettino, tucked away among the rolling hills and valleys of our farm. 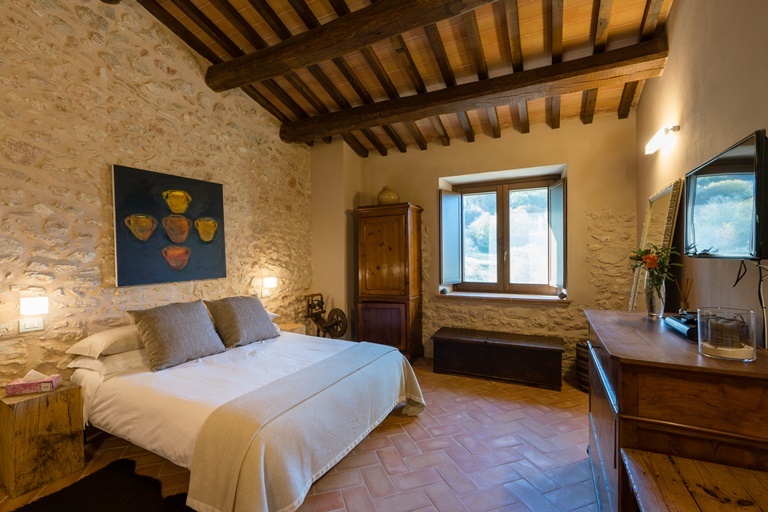 On arrival, you’ll meet the family and drink a freshly brewed espresso coffee before heading off into the forests and fields surrounding the village, with Luca and Alessandro, the truffle hunters. 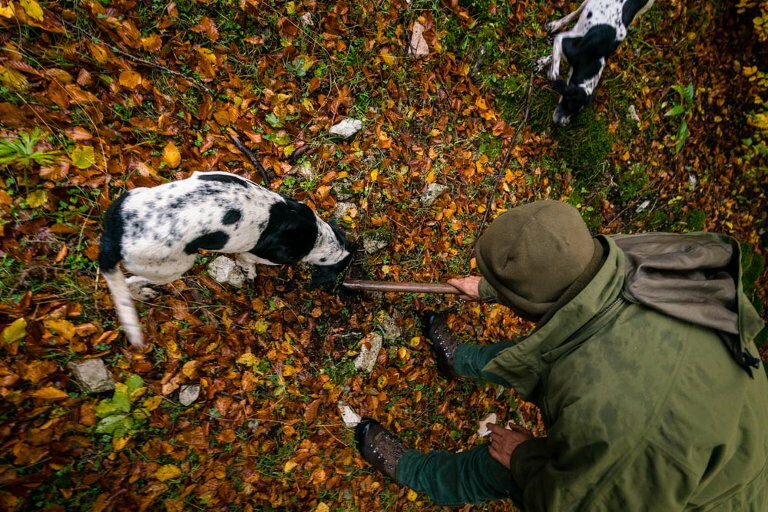 The truffle hunters have many dogs skillfully trained to sniff out the precious Umbrian truffles. It’s a pleasant stroll in some really lovely countryside, with plenty of time to enjoy the views and watch the dogs work. 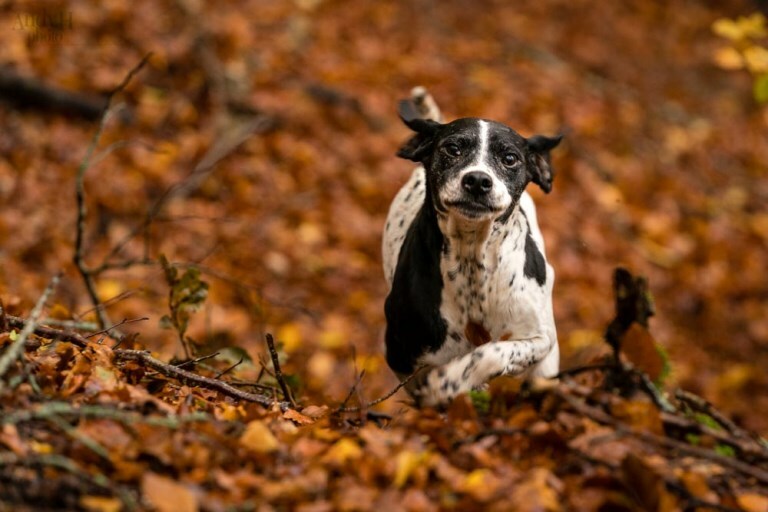 The dogs are always excited to be out truffle hunting and they are fun to be around as they come and go and hopefully bring us plenty of truffles. Sometimes it’s surprisingly easy, other times quite a challenge, but we stroll until we have enough truffles for our big Umbrian lunch. Being an everyday job here in Pettino we are very unpretentious about truffles and you might be surprised how many we can find. You’re welcome to smell them, touch them and of course you will eventually taste them. A truffle snack and a sip of wine is always in the back of a hunter’s mind, so when we are satisfied with the truffle haul, we’ll stop in a panoramic spot while our truffle hunters prepare your first taste of a freshly dug Umbrian truffle and pop a Prosecco cork or two. More often than not the family shepherd will wander by with the flock of sheep and our extremely friendly wolf-chasing dogs. The canines love a friendly pat or two and make quite a spectacle among the sheep. The shepherd also carries a wheel of Francesca’s famous homemade pecorino cheese in which he’ll happily cut a wedge for you to taste. 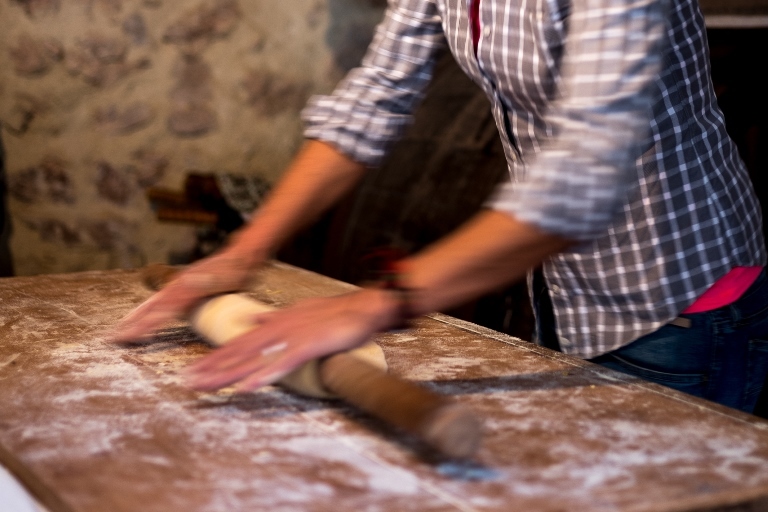 Back in the village we head to the pasta room, where you’ll watch Francesca make traditional fresh pasta from scratch. While you watch, you’ll snack on some of the family’s dry-cured meats like prosciutto and capocollo. Outside, Luca and Alessandro will light up the barbecue and prepare sausages for lunch and wood-fired bruschetta made with our own olive oil for you to taste. You’ll also try other delicacies from our farm all prepared by the Truffle Hunters, while watching the pasta making. All this accompanied by wine made by local producers. You will also visit the cheese ageing room and learn how Pecorino cheese is made. 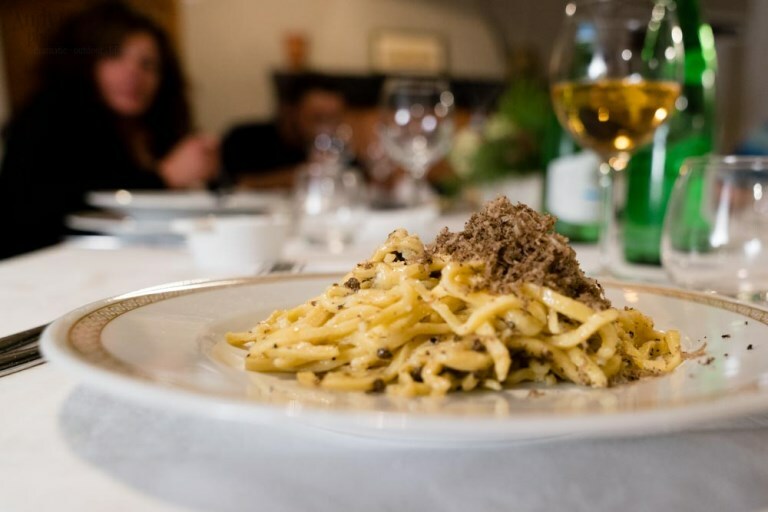 Truffle hunting in Umbria can really work up an appetite, so we’ll head to the kitchen for a very big but very relaxing traditional Umbrian lunch. Everyone joins for the lunch and you’ll try lots of local recipes as well as loads of local wine. The day ends with a strong shot of espresso coffee and hopefully some very happy smiles. Available 3 to 4 days a week from mid-March through to mid-December. Group sizes are from 2 to 16 people. The Wild Foods Truffle Hunting day is great for couples, families and people of all ages. 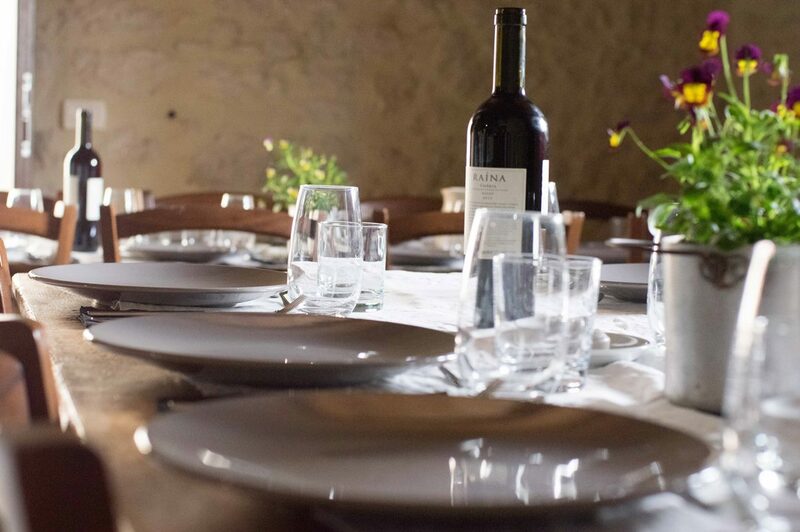 It’s great for foodies and wine-lovers, or for anyone just wanting to immerse themselves in the landscape, people and culture of Umbria. During the hunt you will walk in the countryside so you need suitable shoes for that (e.g. runners are OK). If you have any dietary requirements (e.g. vegetarian, allergies) please let us know when you book. Because we will walk in the countryside, it is not recommended for people who have difficulty walking; however, you are welcome to wait in the vehicle and enjoy the rest of the day in the village. Want to spoil yourself with our most exclusive experience? Treat yourself to the all inclusive, 3 nights 4 days, Wild Foods Epicurean Experience. Book two nights, all-inclusive, at the Black Truffle Lodge, and get 50% off on the Wild Foods Truffle Hunt.